You know those days where the so-much-to-do-so-little-time cliche is overwhelmingly true for you? When you are surrounded by fires and are spinning in circles, beating each blaze in turn? When you don’t even have a minute to think? Our natural response to this is to go in swinging — do as much as we can as fast as we can and all at the same time. This is counter-productive. Our heart is in the right place, but our head isn’t driving. Next time this happens, would you try something new? Take a deep breath and rapidly prioritize. I’m only talking about a minute here, no major planning. Just decide what needs to be done next and then next after that. Once you have a start on your priorities, start doing them. I’m all for plowing — but in a straight line! It works better than running in circles or a scatter-shot approach. 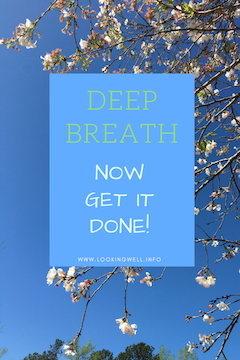 The deep breath gets you off on the right foot. So often we respond to others’ urgency or react emotionally before thinking things through. Remember, tension will work against you. Give yourself a few seconds to make sure you react wisely and think through your priorities well. If you will focus on one thing at a time, knocking them off the list as you go, you will get more done faster. You will be thinking more clearly and be able to handle each item well. Once it is done, you have one less thing to think about, and that relief will snowball the more you do.